Whether you are traveling for Thanksgiving or planning to stay home, stuff your face and binge watch that one epic HBO series you still haven’t seen (like The Wire or Sopranos) you might want to look good…and be comfortable. Because lounging around in sweats and all your un-showered glory for a few days gets old. And sad. But there is a way to wear the same garment every day and still look fresh. There is only ONE piece you need this weekend for whatever casual Thanksgiving and post-holiday plans you have. Wait for it… denim overalls. Overalls have to be the greatest wearable invention. Forget the jumpsuit, forget the little black dress. Denim overalls should live in your closet from infancy to advanced age. You can dress them up (a little) with a great bootie or totally relaxed with slippers and you still look dressed. Overalls are particularly perfect for the holidays because they obscure the carb-overload belly bloat, so you will look amazing as you slip in and out of your food coma. 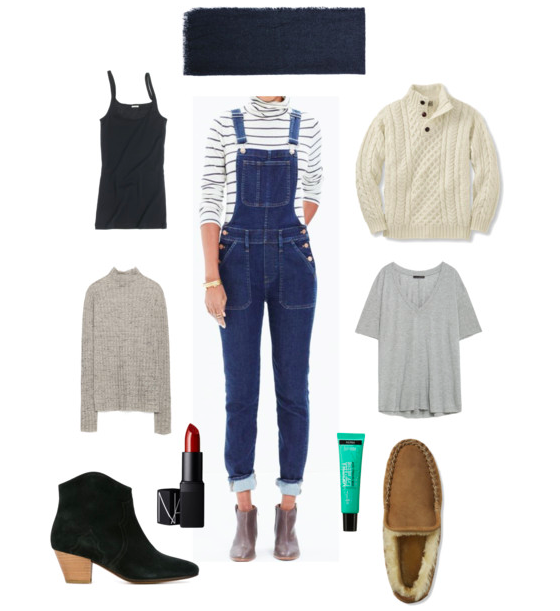 Ok, maybe you can’t just wear overalls (at least not for a family-friendly Thanksgiving) so we’ve rounded up a few pieces that you can mix and match for different low-key long-weekend events. If you’re going away for the holiday…you might throw in a pair of black leggings and something comfy to sleep in. 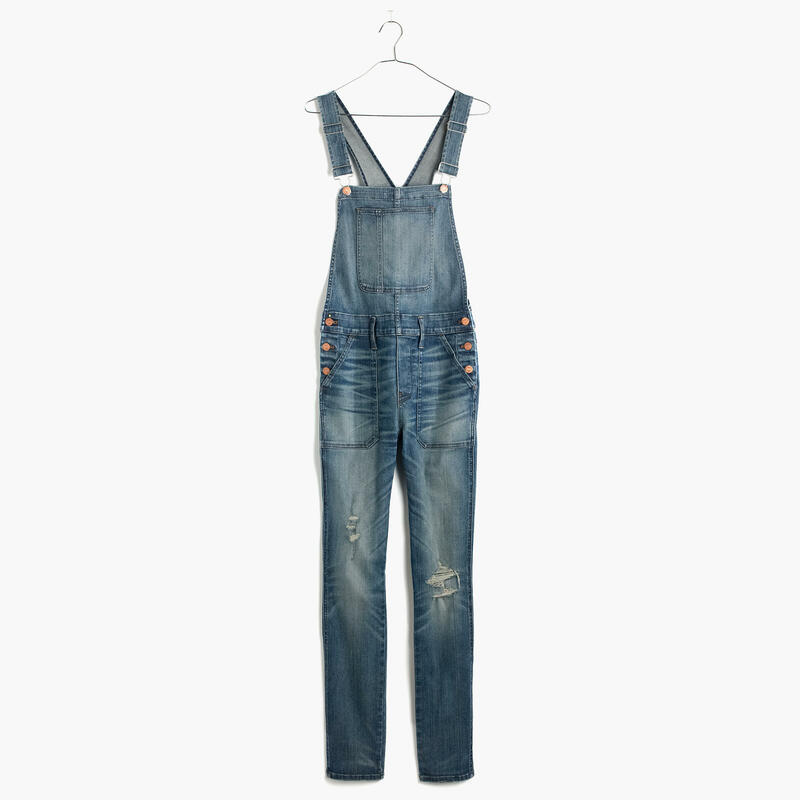 Above: These Madewell overalls ($148) are the main event. They’re darker denim, which can easily dress up or down with the right add-ons, and they have a modern slim silhouette. Clockwise from top: The Zara soft scarf ($30) will work with any look and it can distract from your make-up-free sleepy face. A fisherman sweater (L.L. Bean $169) is perfect to throw on top of the overalls if the temperature drops; try a loose V-neck t-shirt under it all (Zara $20). Soft shearling slippers (L.L. Bean $69) and minty lip gloss (C.O. Bigelow $7.50) are essential for lounging around. For a more polished look brighten your face with red lips (NARS $27) and throw on a low-heel bootie (Isabel Marant Etiole $635). A lightweight sheer turtleneck (Zara $40) layered over a basic tank top (J.Crew $23) will look dressier under the overalls. Plus, if the heat is really pumping and you’re getting egg-nog hot flashes you can strip down to the tank and still feel covered up with the denim bib hiding your middle. With all the stress of holiday shopping, socializing and stuffing ahead you’ll be thankful not to worry about what to wear. Happy Turkey (or Tofurkey) Day!